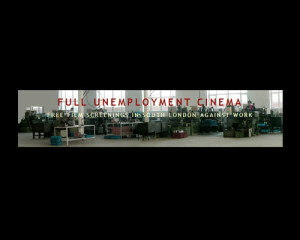 We are a London based collective who screens films once a month around the themes of work, non-work, refusal, struggle and more. We screen films in independent, self organised venues, all our screenings are free and sometimes we sit around afterwards chatting in front of a beer and a plate of pirogis. “This activity has resulted in a research archive of films and texts that critically illuminate cinematic representations of labour, the shifting transformations of work and responses to this, from acquiescence to resistance and sabotage. 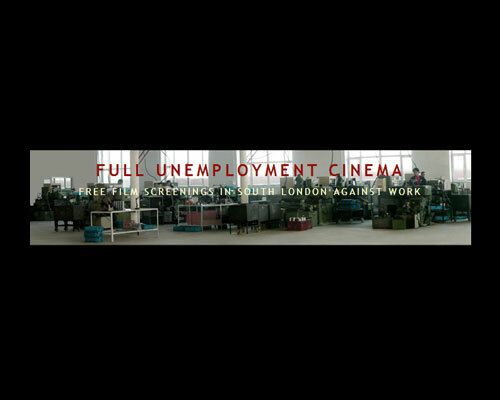 This process helps us think about how cinema might highlight different aspects of the conflictual dynamics of labour such as the contradictions of resistance, desertion, invisible forms of labour and reproduction”. We’ve occasionally been invited to screen, talk, workshop and be resident around the place. We are quite particular about the projects we participate in, and we’re very happy to have been part of a week long workshop with the students of the School of Walls and Space at the Royal Academy of the Visual Arts in Copenhagen; a week residency and screening at Lothringer13_Laden in Munich; a talk at the Tetley in Leeds; and a forthcoming screening and talk at the Public School in LA.